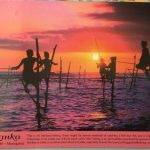 Thank you to Debra for sending this postcard from Sri Lanka, especially as, apparently, it took 4 days to find a shop selling postcards. Debra has shown a level of commitment that Geography Cat commends, applauds and appreciates. Purrs all round! In her postcard Debra mentions the impact of the Indian Ocean Tsunami, which struck the southern and eastern Sri Lankan coast on 26th December 2004. At least 30 000 people lost their lives in the tsunami, and many more lost their homes and/or livelihoods. Debra also mentions the monsoon. Monsoon climate is characterised by having a wet season and a dry season. The wet season is caused by vast masses of warm air; warm air rises and causes low pressure. Any area of low pressure effectively pulls in winds from areas of higher pressure, in this case the area of relatively high pressure is the air mass over the tropical Indian Ocean, and the area of relatively low pressure is the land mass of India. Therefore the winds blow north and bring warm moist air which results in torrential rainfall. The dry season happens in the winter months when the winds are blowing south from the Asian land mass to the north, therefore the air is dry, any moisture having already been deposited in the mountains. However, the monsoon climate of Sri Lanka is different to that of India, and there are two rainy seasons, in spring and autumn. You can find out more here. The green turtle is the most common turtle found in Sri Lanka, it can grow up to 1m and weigh up to 250kg. The main threat to any sea turtle is human activity. The green turtle is used for its meat, turtle eggs are taken for sale on the black market and turtle shell is used for ornaments. The hawksbill turtle is critically endangered due to hunting by people who sell theirshells for the illegal “tortoiseshell” trade. Find out more by following this link to the World Wildlife Fund.